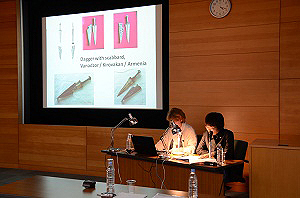 Under the exchange program for museums in Asia, the Japan Center for International Cooperation in Conservation invited Ms. Yelena Atyants, head of conservation at the History Museum of Armenia, to Japan from February 26 to March 3, 2012. In conjunction with her visit, an open seminar on “exchange programs for the conservation of cultural properties in the History Museum of Armenia” on February 27, 2012 was held at the NRICPT. The seminar included a description of NRICPT projects at the History Museum, an introduction to the History Museum, a report on results of the 1st Workshop on Conservation of Archeological Metal Objects (which took place in January and February 2012 in Armenia), and a presentation on exchanges regarding conservation of textile artifacts in the History Museum of Armenia. There is no Japanese embassy in the Republic of Armenia at this moment, so there are few opportunities to widely publicize cooperation/exchanges like those mentioned. Hopes are that the current project will help to facilitate cooperation/exchanges between Japan and the Republic of Armenia in various areas beyond the protection of cultural properties.